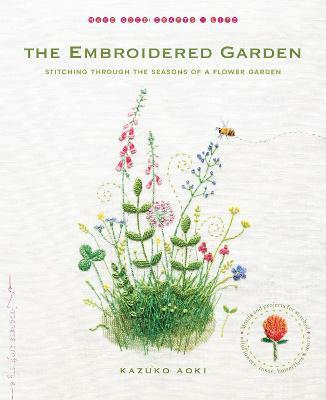 Whimsical, beautiful embroidery motifs created by an avid gardener--stitch roses, bees, or whole garden scenes. Kazuko Aoki has a unique talent for translating the beauty of the garden with needle and thread. By offering forty motifs, Aoki invites us to explore her gardens through embroidery. The forty motifs explore the roses and wildflowers that appear season to season, as well as the bees and butterflies that enjoy their nectar. The designs here are exquisite, detailed, and artfullly rendered. Beyond the motifs themselves, Aoki also presents projects that feature the embroidery: brooches, notebook covers, pin cushions, and pouches. For those new to embroidery, detailed how-to illustrations are included.